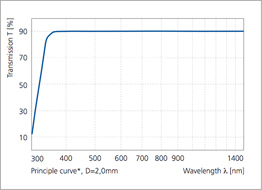 B 270® - Superwite is a universal economically priced quality glass with high transparency for visible and near-infrared light. 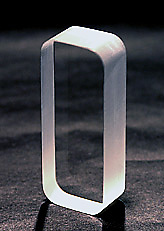 The SCHOTT glass has a colorless crystal clear appearance and is very stable to the solarization effects that usually occur when a material is continuously exposed to the sun or UV-light. When other glass materials begin to change their color, B 270® stays white and clear. B 270® is available as drawn glass, fire-polished sheet glass, or in the form of unpolished raw glass ingots. B 270® as sheet-glass exists at many standard thicknesses. For applications where surface quality and waviness is uncritical, it can be used without further treatment. To meet the requirements of more demanding optical applications, B 270® sheet glass materials should be mechanically ground and optically polished. Grinding and polishing facilitate B 270® also to be used for more sophisticated optics at reasonable cost. In addition to B 270® the new B 270® i is now available. 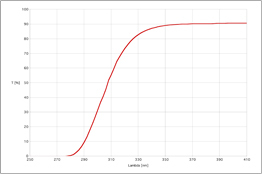 The improved glass composition offers better chemical resistance, which primarily allows the material to be used for special applications in biotechnology. All other physical properties remain the same. The marked thicknesses (✔) are available within our 48h–Express Service. Many other thicknesses are possible on request.